Once upon a time, in the outskirts of Canberra, a new gallery was built in the heritage grounds of Lanyon. 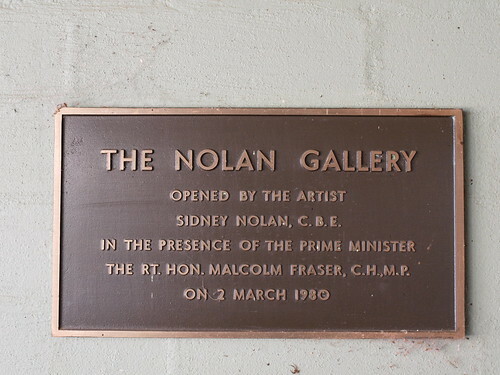 It was the Nolan Gallery – opened by the man himself, after he donated a large collection of his early paintings to the Australian People. The idyllic rural setting of Lanyon, with its historic homestead, appealed to Nolan as an ideal location for a gallery devoted to his works. He was, by all accounts, thrilled with the arrangement. For 26 years the gallery chugged happily along, but in 2007 it was suddenly declared that the Nolan Gallery was unfit to house such an important and valuable collection. There were problems with humidity control, the ACT Government said, and security too. It was agreed that the collection would be temporarily moved to the safety of the Canberra Museum and Gallery (CMAG), in the city, while the necessary changes were made to the Nolan Gallery. CMAG took to their new charges immediately – hanging them proudly within the Permanent Collection galleries. The Nolan Gallery sat patiently in waiting, shut off from the tourists of Lanyon, a ‘temporarily closed’ sign tacked optimistically to the door. Just last week came a new decree: the Nolan collection would now be permanently housed at CMAG. The ACT Chief Minister reaffirmed: the Nolan Gallery was not suitable, and besides, it had only had a few hundred visitors a month. He let slip that he had already allocated a budget to build a new gallery space for the collection within the existing CMAG building. Nolan’s widow – Lady Nolan, who has been advocating the return of the works to Lanyon ever since they were first removed, is devastated and outraged. She maintains it was her husband’s wish for the works to be displayed at the Nolan Gallery, that he only gifted them to the Commonwealth with this end in mind. Her pleas and demands continue to be met with patronizing response – as if she would know little, if anything, about what was best for the Nolan legacy in Canberra. At her wit’s end, she has been quoted: “If the Nolan Gallery is not to be returned to its former use…I will insist that the works on loan be returned to me forthwith.” She is threatening to not only remove works from the public sphere but to relocate them to her home in the UK. What is really going on here? That the Nolan Gallery has been deemed unsuitable begs the question – why not make it suitable? Why spend money making CMAG fit to house these works, and not the home they were originally intended for? Why go against the wishes of an Australian cultural icon, to risk losing treasures of Australian art? Is this just a sneaky way to bolster the appeal of the Canberra Museum and Gallery, an organisation who at times struggles with purpose, direction, and poor visitor numbers itself? And what does this mean for Lanyon – one of the region’s prime tourist attractions, the Nolan Gallery a former jewel in its crown? Whatever the real motive, the Nolan debacle demonstrates the Government’s complete lack of respect and/or understanding of artists and their legacies. What’s more, as pointed out by Betty Churcher when interviewed on ABC local news, it sends a warning to potential benefactors: an example of how quickly their wishes and intentions can be cast aside by those wishing to fulfill private agendas. Hopefully Lady Nolan sticks to her guns and the government wakes up to themselves. Political bickering over the hierarchy of state galleries will be irrelevant and forgotten in 50 years. Nolan’s works and wishes won’t be.